The idea for Póg began over ten years ago. After losing a lot of weight at age 16, and changing my lifestyle and eating habits I always toyed with the idea of creating a restaurant that offered healthy, low calorie options. I wanted to show people that living a healthy lifestyle wasn't just 6am hill sprints, and tasteless rabbit food. Somehow the dream has become a reality and we have been trading since February 2014. The cafe culture is stronger than ever and we are so passionate about giving our customers the best experience we can. We travel the world to find the most innovative, exciting menu options and labour in the kitchen to make the best healthy/vegan alternatives to your favourite classic treats. HERE AT PÓG, WE BELIEVE THAT A HEALTHY LIFESTYLE IS A HAPPY LIFESTYLE. All of our products are carefully selected to ensure our customers are eating good food that is high in protein, vitamins, minerals, good fats, and lots more. We also put a huge focus on the presentation of our food. We believe that every dish should appeal not only to your taste buds but also to your eyes. The base of all of our salads is green leaves. Spinach, rocket, iceberg, and kale are some of the most nutritious foods that we can eat. Per calorie, kale has more vitamin C than spinach and oranges, more iron than beef, and more calcium than milk. Greens help in the detoxification of our cells, and they have anti inflammatory properties, green leaves also reduce our blood sugar levels and so they reduce hunger and cravings. We should include green leaves in our diet every day. On top of all of these amazing nutritional benefits all of the toppings in our salads are bursting with even more goodness like chicken, smoked salmon, almonds, flax seed, beetroot, eggs and loads loads more. While the taste and texture of our salads is incredible, they are also seriously low in calories and are served in huge bowls leaving you really full and satisfied. We serve a selection of freshly made juices and smoothies that are designed to give our customers an instant hit of ‘liquid nutrition’. Our juices are made with fruits and vegetables to order. The process of juicing breaks the cells of a fruit or vegetable and it takes all of it’s nutritional goodness allowing our bodies to absorb their nutrients with minimal digestion. Freshly made juice is a great way to get your five a day and they also taste pretty great! You may have spotted our protein pancakes over in Instagram, perhaps that is what has brought you here. 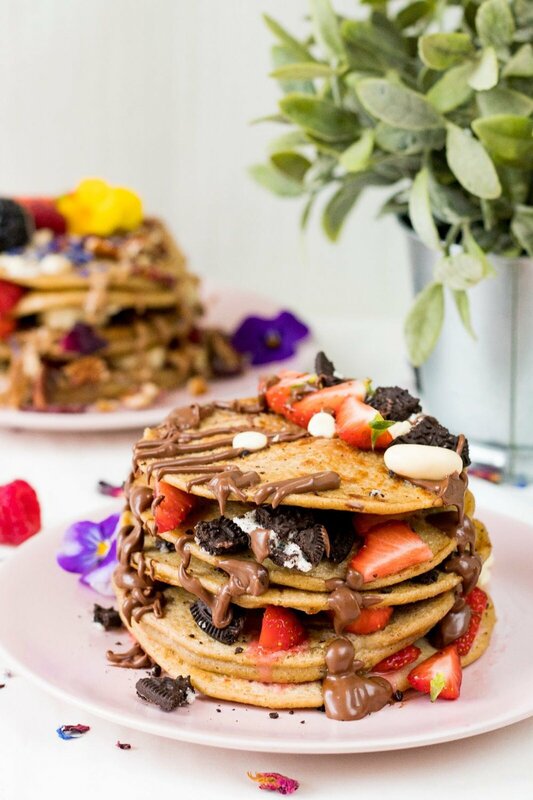 Our pancakes are only 257 calories per portion and contain 27 grams of protein (before the toppings) and believe me, they taste as good as they look. Our superfood bowls are wildly popular. 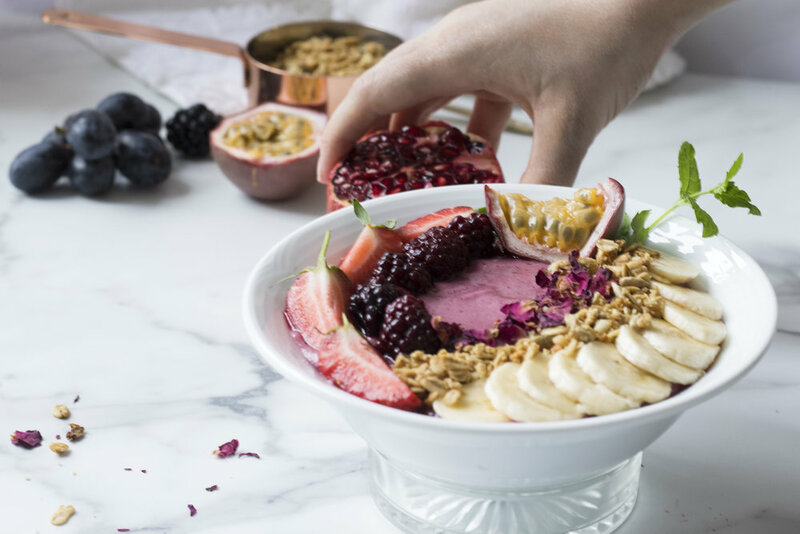 Acai, dragon fruit and matcha are some of the most powerful superfoods around. 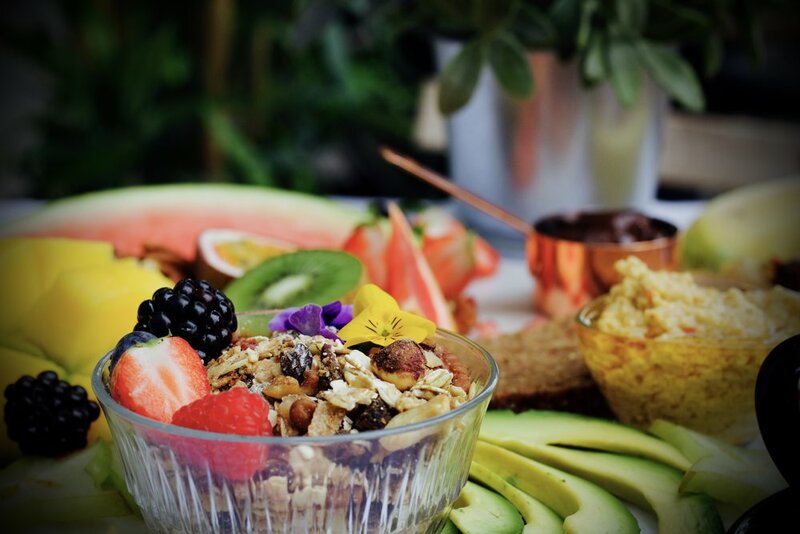 Our bowls are beautifully designed with flowers, fruits, coconut and more. We have taken the old fashioned english tradition and put our own twist on it. Our vegan afternoon tea is fast becoming an iconic addition to the vegan food landscape of Dublin. We have ditched the soggy cucumber sambos and spiced things up with some of our favourite vegan options. You will indulge in our selection of sourdough toasts, a succulent sweet potato and quinoa burger, creamy cheesecakes, banoffee pies, and much more. All accompanied by unlimited tea and coffee of your choice. For a particularly special experience, you can enjoy a glass of bubbles. Overall, a wonderful indulgence that will leave you satisfied and happy, not to mention being kinder to the planet. Please send your reservations to Bookings@ifancyapog.ie. Before you get in touch, we get hundreds of questions by email every week so maybe on the of the following will answer your query. Do you do gluten free and/or vegan pancakes? Yes we serve gluten free and vegan pancakes, there is a €1 supplement for these options. Yes they can be purchased in either store. They are not available for purchase online. Do you take bookings for big groups? Yes, with a security deposit. Can I make a booking for Bachelors Walk? No, it is walk in only. We take bookings in Tara Street only. Do you serve the protein pancakes all day? Yes! If were open we are serving pancakes. Do you do offer catering services? Yes, please email rachelk@ifancyapog.ie for more info. Do you have the calories and macros for the menu items? Not right now, were working on it. Yes, our Tara Street Restaurant is wheelchair friendly. Bachelors Walk has a step up to the main door which makes it a little trickier.